Because I don't have enough on my plate already, I decided to take up another fun project. I couldn't resist picking up Wreck This Journal by Keri Smith at the bookstore after reading about it on Our.City.Lights. However, as book lover & a perfectionist, this is going to be quite the challenging project. 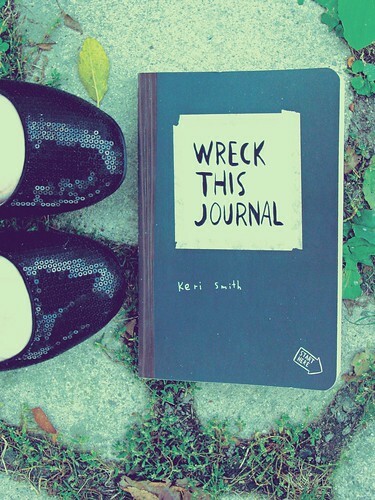 The idea behind Wreck This Journal is to destroy a perfectly good book with challenges like spilling coffee, taking the journal into the shower, and the dreaded ripping out of pages. I'm still rather excited to do something completely out of my comfort zone. I'll be joining Diana and posting my completed journal pages both here on my blog and on flickr. Won't you join in the on the fun too? My hands are too full to try it out myself.